Bio Genesis Health Cluster is pleased to announce WORLD CONGRESS ON BIOTECHNOLOGY AND HEALTH CARE SUMMIT- 2019, "International Conference on biotechnology and health care summit " is scheduled on 28th and 29th August 2019at J.N Tata Auditorium, Indian Institute of Science, Indian Institute of Science, Bengaluru, Karnataka.The theme of the conference is "Current Research & Innovations in Biotechnology" World congress on biotechnology and health care summit-2019"Current Research & Innovations in Biotechnology" is unique in bringing state-of-the-art in the field of biotechnology. It will provide an excellent opportunity to scientists to benefit from the lectures of top scientists on the current state of developments and the new challenges facing the scientists. The conference aims to shed light on the translational nature of biotechnological research, with emphasis on both the basic science as well as its applications in industry and academia. Latest researches, business development, strategic alliances, partnering trends, product opportunities, growth business models and strategies, licensing and pharmaceutical biotechnology (e.g. 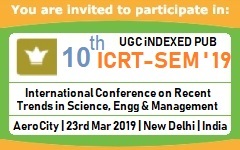 vaccines, CNS, cancer, antibodies), medical biotechnology, industrial biotechnology, bioprocess engineering, protein engineering, plant and environmental technologies, transgenic plant and crops, bioremediation, and microbial diversity research will be the topics of discussion. The scientific program will feature live workshops, interactive education sessions, B2B meetings, round-table discussions apart from the conventional plenary sessions, featured symposia, breakout sessions and oral presentation sessions for abstracts and challenging cases.